Our upcoming move across town came with it the last invitation to speak in our beloved ward. And so it was with bittersweet tears did Chup and I give our last testimony. Wasn't that a really good beginning paragraph? I am working on my introductions so that people with google readers and other RSS feed subscribers will want to read my whole post. There will be a short quiz at the end of this essay to see if you endured to the end. Enduring sometimes is a patronizing word by-the-way-bluejay. I am to the point where I don't kid myself. I know that most of the ward isn't listening the speaker. Think about it, do you really listen at church? Primary Age: Doing busy work. Young Adults: Our ward doesn't have any. People like me with no kids: Also thinking about food. Parents: Busy doling out busy work and/or quieting toddlers who have hit their head on the pew. Senior Citz: Normally can't understand me when I talk (lisp). Bishopric: Looking out on congregation assessing needs and/or making mental lists about welfare of ward. Other speakers on stand: Reviewing their own upcoming talk. So really it's just you, the mic and the eager-to-help box of Kleenex on the podium. I don't even know if we can afford Kleenex. Probably more like Dollar Store Delight Your Tears brand. The point I am making is that there is no point in being nervous when talking in church. But my palms always sweat like a date with gastric distress. I can't help it, I've got a genetic propensity for sweaty palms. You know what? One day I'll invent deodorant for the palms. Dollar Store Dry Your Palms brand. Now I am just being silly oil lilly. I delivered my talk, a short and simple account about our trial of infertility (or what we thought was infertility, but turned out to be more like "the Lord's timing") and how we prayed and prayed for a baby. A couple times my eyes caught a glimpse of a really busy family on the front row and was satisfied that the attention wasn't on me (and my lisp). As for the rest of the congregation, they were a mass of colors because I didn't wear my glasses and on top of having (a lisp) I am somewhat blind. I also had Goat Voice for the duration because talking about blessings makes me a wee bit emotional . . and despite other physical deficiencies I do have a heart. As the meeting closed, and the prayer was said, well-wishers came to give Chup and I a lasting hug. (Hugging Chup is an adventure anyway.) As all of this was transpiring I felt a tug at my dress. "Sister K?" said little Chantal, she of the Front Row Busy Family. "Yes?" I replied, crouching down to hear her. "I drew this for you when you gave your talk." 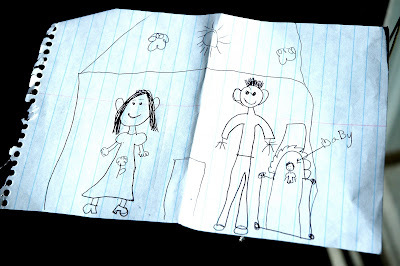 Her big eyes were just a tiny bit teary as she handed me her hand-drawn account of me (a flower on my dress) Chup (a healthy set of ears) and our baby-to-be (in a fine-looking crib). Primary Age: Doing busy work and listening. Apparently. Oh the things I've got to learn, yet. Promised Quiz: What do you think the author of this essay was trying to say about the capacity of a child's account of empathy? How could the author have prepared herself for a likewise celestial experience? How does this differ from your own inwardness in times of enlightenment? Expand. And repeat.